Zach Parise's second goal (20 and 21) of the night with just under six minutes to go in the game was the go-ahead goal and Jay Pandolfo slammed the door two minutes la ter with his fourth goal of the year to lift the New Jersey Devils to a come from behind 4-3 win over the St.Louis Blues. Brian Rolston scored the other Devil goal (5). 1) I watched very little of this game live as I missed the first few minutes due to watching the end of Maryland's win in the Roady's Humanitarian Bowl over Nevada and went to bed in the second,so the rest of the game was a tape delayed one for me. 2) I know I write this a lot,but it is nice to write for positive reasons-Goals happen when you crash the net! Zach Parise scored one his goals by simply being in front and making things happen,while the Rolston goal was off a rebound off Manny Legace after a David Clarkson shot. Why the Devils don't do this every night makes me so frustrated sometimes! 3) Here's some credit for sharp passing to a player not noted for it in Mike Rupp. Rupp's pass to Jay Pandolfo on a 2 on 1 gave the Devils an insurance goal that it turned out they would need. 4) Perhaps it is time to consider locking Zach Parise up to a long term contract to keep him as a Devil for a long time. A poster over at In Lou We Trust suggested it a while back and I have considered it since then. Finally,the Devils have a top notch goal scorer,which is hard for a team that is among the best every year to find,unless you want to be like the Penguins and be awful for ten years to get those types of players. It would be nice to have him for the course of his career. 5) Maybe the St.Louis jerseys are just a super dark blue,but they sure looked black on the Versus telecast. If they are black jerseys,that is dumber that I can imagine! Hang in there for my thoughts on the Browns hiring process and a look back at the Crennel/Savage tenure. I am looking forward to doing those,but I want to take the time to do them well instead of rushing through them. I have no intention of recapping the Browns loss in Pittsburgh with t his exception. 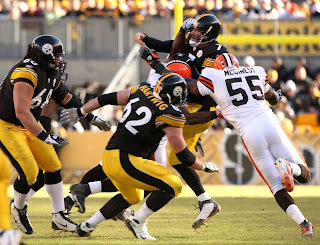 The hit on Ben Rothlisberger was not a dirty hit. Willie McGinest is an aging player that has been become a shell of what he once was,but McGinest is not a dirty player,the hit was not crown to crown (which the NFL defines as an illegal blow to the head with the helmet) and anyone that thinks it was just doesn't know very much about the game. Seattle will pick 4th and Cleveland 5th in the 2009 NFL Draft,which hopefully can add an impact player to both teams. I enjoyed the Humanitarian Bowl from Boise and was rooting for Maryland,but head coach Ralph Friedgen made an error in playing runner Da'Rel Scott in the second half. Scott was the difference in the game as he ran for 174 yards and two touchdowns on just 14 carries. But why was this an error? Scott was one of several Terrapins that were punished for violating team rules during their Boise stay. The New Jersey Devils scored early on a Brian Rolston power play goal (4) and then slammed the door on the New York Rangers with a Patrik Elias shootout goal (17) and despite two Ranger rallies,the outcome was never in doubt as the Devils grabbed a 4-2 win over the Rangers at Madison Square Garden. Travis Zajac (10) and Zach Parise (19) each scored goals that pushed the lead to two goals after the Rangers cut into the lead. 1) The Devils played with tenacity tonight and never seemed to be on the verge of losing even when the Rangers were outshooting them and trimming the lead. The Rolston goal came on a blast from the point,but credit to David Clarkson for screening Henrik Lundquist,who never saw the shot. 2) Hustle points to Patrik Elias,who was doing his job killing a penalty and that put him in position to breakaway and beat Lundquist one on one. After that play,you could see the Rangers sag and effectively end their evening. 3) Tossing some credit to Scott Clemmensen and the penalty killers that killed off a five on three situation without allowing a goal. Clemmensen made an excellent save on Chris Drury's shot and turned aside the Nikolai Zherdev followup shot. 4) The Travis Zajac goal was a pretty one as well,as Zajac smashed a shot off the pipe and past Lundquist. Zajac got a lot of stick on that shot and showed the power that he rarely unleashes. 5) Dainius Zubrus showed up,I could have almost sworn that he sat out the last two games,his name was seldom called. Sorry to hear of the passing of one of my old favorites from the horse racing game as Ruhlmann passed on at the age of 23. Click the name of Ruhlmann for a nice blog post on him by the people that cared for him. The Browns would pick 7th in the NFL Draft as of now,but could get as high as fourth depending on the events of today. I figure Arizona will try to rest some players and that might be enough to get the Seahawks a win. Ruslan Fedotenko's second period shot was just enough steam on it to make it into the net after Scott Clemmensen was able to get some of the puck deflected and that summed up the scoring for the night as the Pittsburgh Penguins topped the suddenly punchless New Jersey Devils 1-0. 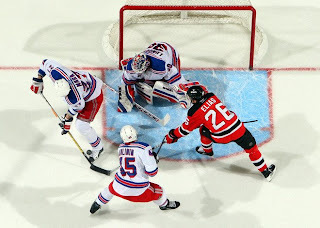 The Devils travel to the big cesspool for another divisional tilt against the Rangers at 7;30 tonight. 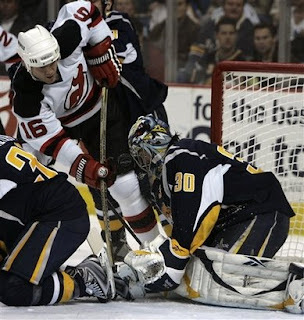 1) The Devils had several chances to score in this game as Jamie Langenbrunner missed two wide open nets and Travis Zajac missed one early in the game that could have set the tone for the evening. 2) The Penguins Marc-Andre Fleury played very well,so don't take this as a criticism of the Pittsburgh stopper,but the Devils had numerous rebound opportunities to pounce on them and no one was there. Teams that crash the net tend to do better than teams that don't and when you look when the Devils were on their solid run,they were doing that. 3) This is related to number two in a way. 4) Doc Emrick hung in there for two and a half periods despite having a bad cold and sore throat. 5) The possible game tying goal by David Clarkson with four minutes that was reviewed and ruled no goal was a call that I thought was a good one. Cleaning the in box out with a few things that I didn't have time to write about. 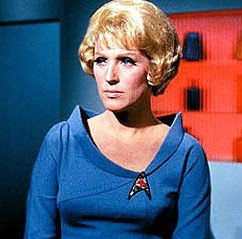 As a Star Trek fan,I was sorry to hear about the death of Majel Barrett Roddenberry last week at the age of 76. Nurse Christine Chapel in the original series of the franchise. The Mansfield Ohio speedway closed its doors as well over the week and as a result was forced to transfer the Craftsman Truck Series race (Kinda the NASCAR version of AA baseball) to Newton Iowa. Battlin Bob sends us word of a Pirate caravan stop in Cumberland Maryland on Jan 19th. The Pirates are sending Sean Burnett,Ryan Doumit,Manager John Russell and announcer Tim Neverett and Bob Walk for the Cumberland leg of the goodwill tour. Last week,I made what I try to do every year,but cannot always pull off and travel to Hershey Pa. to see the hometown Hershey Bears play the Lowell Devils. Of course the Devils are why I go,but going to live hockey ranks among the best sporting experiences that you can have. Hockey is different than baseball for sure as a live game takes place. Baseball is so much more of a casual experience talking the game and looking at nuances,while live hockey is much more of a can't take my eyes off the game and leaves little time for in-game chatter. I cannot say that I prefer one over the other,just very different. After traveling to the Chocolate capital,we had lunch at a place called the Bears Den,which shockingly enough, is a sports bar/restaurant located as part of the Hershey Lodge hotel facility that has a Hershey Bears theme. The prices were a hair high,but not ridiculous and the food was quite good. I highly recommend it,if you ever make a Hershey stop. I particularly liked the glasses with the skating Bear on them,had they had them for sale,I might have bought one. 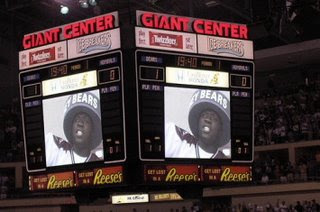 The Giant Center was built for the Bears in 2002 with a hockey capacity of 10,500 and replaced the badly aging HersheyPark Arena,which still stands and hosts smaller events. Giant Center pretty much hosts three things from what I can tell-the Bears,concerts and it seems like the WWE comes to Hershey more than one would think for the arena size or local market,so there must be some things that McMahon and company like about the facility. It does have a major drawback as far as aesthetics go. The color scheme matches the Bears/Hershey chocolate color motif and as a result as you walk around the concourse,one can get very tired with the drabness. The Bears have a very nice team shop with lots of items,but if you are looking for anything from a team other than the Bears with the exception of AHL pucks,you will be disappointed. I bought a Lowell puck and I was finished. Which wasn't bad for the wallet. The Hershey fans in general seemed pretty knowledgeable about the game and I spoke with a few before the game started. There may be another difference between baseball and hockey fans,the fans in Hershey knew their stuff,unlike so many baseball patrons that barely know a glove from a bat. They also have a local chant that is used for every goal that is pretty anno ying and it comes complete with goober leading the chant on a taped deal on the video screen. No youtube on this guy,but here is a picture courtesy of our friends at Mondesi's House. This looked to be a beating in the making as Lowell is in last place with Hershey in first and a cursory look at the rosters tells why. Hershey seems to be a typical AHL team that uses veterans that really have little NHL future to help them be in the playoff race every year. Their parent team in Washington sprinkle some borderline prospects in with AHL vets like Keith Aucoin,Graham Mink etc with a few guys that just aren't going to be NHL players like Chris Bourque to have a top notch contender every year. That isn't the way the Devils do things,as they use players that need seasoning ,they play them a lot and winning is not as important. Does Lowell have AHL veterans? Sure,but they are used in roles to help the prospects mature,not as the base of the franchise. The people that the Devils think that could help them down the road play and if Lowell is a perennial bottom feeder,such is life. I can understand why Lowell fans wouldn't be thrilled and that is the reason the Devils and Albany had such a acrimonious split,but the Devils weren't going to allow that to happen again and that is why the Devils OWN both of their farm teams in Lowell and Trenton. The game was solid enough,Hershey scored 11 seconds into the game and held as much as a three goal lead,but the Devils would get as close as 3-2. Jon DiSalvatore scored the first Devil goal as he left the penalty box and was greeted with a laser pass from Matthew Spiller. DiSalvatore beat Hershey netminder Daren Maschesney to the near side of the net over his glove to trim the score to 3-1. Barry Tallackson,who has been a long time prospect that has always struggled with injuries,would score his first goal of the year in the third period for the other goal. Hershey scored an empty netter for the 4-2 final,but an interesting story on that play. Anssi Salmela controlled the puck behind the empty goal with time ticking away,but a line changing miscue left Salmela with no one to pass to and no one to charge the ice with. Salmela screamed at the bench for help ( I know this because our seats were on this end, only 4 rows from the ice!) and finally had to make the rush himself and was double teamed by two Bears. The puck was stripped from Salmela and that was the game. I was impressed with Salmela though and if he doesn't get frustrated with being at Lowell,his offensive game is going make him a long term contributor. If he doesn't get ticked off and return to Finland that is. I also liked the hard nosed play of the Devils top pick in 2006,Matt Corrente. Corrente might not be a huge offensive threat,but he hits and plays physical and takes no crap as seen in this fight from the game against Hersheys' Steve Pinizzotto. I was also encouraged by the play of defenseman Mark Fraser,who seemed to be a bit more physical than the scouting reports said. All and all,a good night and a chance to see some Devils of the future and a few that have seen the big roster such as Petr Vrana,Pierre (3L) LeBlond and Rod Pelley. But the night was not over,as we attempted to brave the cold to get some Devils for the collection. The security guys are pretty cool and allow collectors access to the loading docks at the back of the building and try to get the visitors as they go to the bus. The Bears exit is on the other end of the building,so you have to pick which team that you will do for the evening..
As this was Lowell's only visit to the Giant Center this year,there were a few more collectors than normal there from what I was told,I suppose there was 7 or 8 there. I was told that the security isn't as accommodating when the WWE is town and will chase collectors away,but that could be a McMahon rule more than a Giant Center decision. I was able to get most of the players that I wanted (that I had cards for) except for Anssi Salmela,who must have gotten by me. I knew the guys that played in NJ and they were more than kind as I got Rod Pelley(who graciously added a "Go Bucks" to his card),Petr Vrana,Barry Tallackson and Pascal Rheaume. I was also able to add some prospects by looking at players as they signed for others,Matt Corrente (Very nice),Jeff Frazee and Mark Fraser all signed. But I was the only collector remaining as coach Kurt Kleinsdorst came out and signed the card that I had for him. Kleinsdorst asked me where I was from,how long I had been a fan and if his guys had all signed for me.I told him I missed Salmela,but he didn't refuse-I just missed him. He thanked me for coming out and for supporting the organization.Great guy. I must add this,I love Hockey,but the hockey collectors are a different breed. I was dying in the cold and the nasty nights are yet to come! There is no way that I could do what they do,once a year to see the Devils-OK,I'll tough it out,but all the time???? Merry Christmas to everyone and I hope everyone enjoys the day! Quick post on the Seahawks 13-3 win over the visiting New York Jets in a game that not only was played in the snow,but might have also cost the Jets a playoff berth with the loss. The Seahawks improved to 4-11 on the season and continue to cost themselves draft position with their back to back wins. 1) I thought this game turned on the first drive of the game. The Jets stormed straight down the field to the Seattle two,where they faced a 4th and 1. The Jets decided to kick a field goal instead of going for the first down behind the offense that had smoothly moved the ball against the Hawk defense. 3) Lots of credit to a rebuilt offensive line that started the game with exactly ZERO starters. Not to mention,two of those five playing out of position. Those fellows should get the credit for the 116 yard rushing day by Mo Morris. 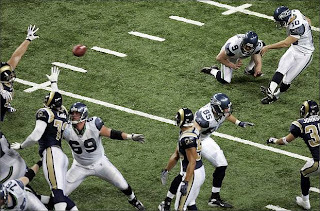 4) In the last home game for Mike Holmgren in Seattle,could there have been a better way for the Seahawks to score their final TD for Holmgren than the patented two yard flip to the tight end (John Carlson)? Holmgren has made a living off that play for years. 5) Check out Field Gulls for a great post on the little things that make a difference in player evaluation and how that sent John Carlson to the Seahawks. Looks like indeed it will be Bruce Gradkowski getting the start for the Cleveland Browns on Sunday in Pittsburgh. The Pirates have made the decision to start Pedro Alvarez at High A Lynchburg in 2009. Smart move,the more you challenge him the faster his development moves along. Lynchburg's first visit to Frederick is May 18th,hope Alvarez is still there by then for signings sake! The former home of MSNBC in Seacaucus NJ is being reopened as the new home of the Major League Baseball network. The MLB network hits the airwaves next Thursday on New Year Day. Some interesting personalities at the new network. The good:Al Leiter,who I thought was very good doing Yankee games and Trenni Kusnierek,who was a favorite of ours (and especially Ryan's) for her work with FSN Pittsburgh. 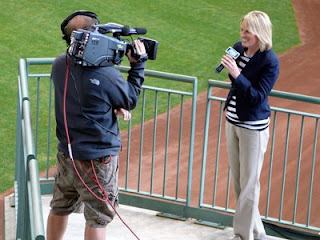 The Bad:Matt Vasgersian,who has been bad at baseball and football and Hazel Mae,who did little to impress me when she was at NESN other than keep the more talented Kathryn Tappen in a smaller role. As lackadaisical as the Devils win over Philadelphia was on Sunday,that is how intense last night's game against the Boston Bruins was and despite a 2-0 loss to the Bruins,there was much to be pleased about. The Devils stood nose to nose with the top team in the East and did not allow the scoreboard to be used until the third period,plus the second Beantown goal went into the empty Devils net. New Jersey takes Xmas eve and day off before returning with back to back games on Friday and Saturday with divisional wars with the Penguins and Rangers. 1) I am not sure how to feel when a player that you really like be ats you. Does it make the loss easier because someone that you like did it and did well or harder because you think "Damn,I wish he was here"! That was the case last night when Milan Lucic was the player that won the game for Boston. With Lucic,it is a mixture. It made it easier to take and I still would love to have him as a Devil. 2) Lucic added his name to the short list of players that I seem to tolerate doing well against the Devils along with Richard Park of the Islanders and Vinny Prospal of the Lightning. 3) The goal was not Scott Clemmensen's fault as Zdeno Chara's shot bounced off Clemmensen straight to Lucic for the game winner. Clemmensen played well,he just wasn't perfect on a night when Boston's Tim Thomas was. 4) Want to see the small difference in getting a point or not? The Devils had one chance in the second period,when Jamie Langenbrunner fired a shot that Thomas deflected and looked to be headed to Patrik Elias for the easy goal. 5) In the loss,Patrik Elias point streak was snapped at ten games. If you watch the Lucic goal closely,watch Travis Zajac on the Chara shot. The shot breaks his stick and that hinders his chances of clearing the rebound away. I really like the Ryan Doumit contract extension. Doumit gets far more money and the Pirates not only buy out his arbitration years,but they also can eliminate his first two free agency years by exercising one option. This is unique as the Pirates have one option to keep Doumit for two years. The usual clause would be a separate option for each year,so creative for the Doumit reps to put the pressure on the Pirates at that time. In any case,I like the move. At that same time,I don't like various voices getting on Neal Huntington and the Buccos for not getting a similar deal with Nate McLouth done. As Ryan knows,I have always been a Nate McLouth booster as far back as when the Chris Duffy love started for the first time. Even then,I thought Nate was the better player and that (thus far) has proved to be true. However,when you consider that last year was McLouth's first year as a starter,his numbers are skewed between his first and second halves and that the two best prospects in the Pirate system are at his position (Andrew McCutchen and Jose Tabata),that a similar contract for McLouth makes little sense at this time. McLouth doesn't seem to have the bat to play the corner on a good team (although that shouldn't affect him in Pittsburgh for a while),so his value is as a centerfielder. The Pirates signed six players to minor league deals. Denny Bautista returns as does Juan Mateo (from AA Altoona) with pitcher Chris Bootcheck. Garrett Jones and Andy Phillips look to be part of the Indianapolis infield and Jeff Salazar looks to be a possible outfielder partner for the I-Indians as well. The New Jersey Devils take on the Boston Bruins tonight for the first time this season. The Devils won a sloppy,uneven effort on Sunday in the shootout for a 3-2 win over the Flyers. Jamie Langenbrunner had to score to keep the shootout going with the Devils down 1-0 and the captain came through. A Scott Clemmensen save gave Travis Zajac the chance to win the game next and Zajac did just that for the win. Devils goals to Patrik Elias (16) and Brian Rolston (3). 1) The game really was three different games. A dull first period,the second to the Devils and the third to the Flyers. 2) Scott Clemmensen really kept the Devils alive in the overtime with two great saves with one being dead on from Jeff Carter of the Flyers. 3) The game may have been sluggish due to the 1 PM start time. Not many games start at one and the players for both team could have been off their body clock. 4) Really looking forward to tonight's game against the surprising Bruins. Boston seems to be the real deal thus far. 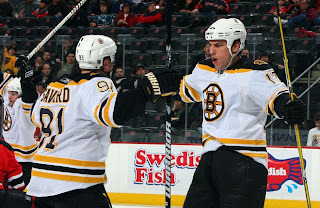 5) The game is also a chance to get to see a favorite of mine in Boston left winger Milan Lucic. Mark Teixeria to the Yankees. What a surprise and it sure is nice to see that the economy has helped the Yankees stay fiscally sound. The Post-Gazette reports the Pirates are interested in Rocco Baldelli. Until tomorrow with Devils-Bruins and a look back at Seattle in the snow. The Cleveland Browns looked absolutely pathetic in a 14-0 loss to the Cincinnati Bengals in the home finale' yesterday. Cleveland Browns 76 passing yards. Leon Hall-Bengal CORNERBACK,3 picks for 87 yards! You could not make that up!! 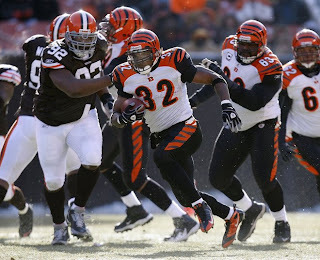 3) Great job by the Browns in holding Cedric Benson to just 171 yards on the ground in the game. Benson put career high numbers up against the Browns as he smashed a career high of 109. 4) Apparently defensive tackle Shaun Smith punched Brady Quinn in the face last week and as a result was inactive for the Bengal game. I think that we should applaud Smith,after all-it WAS the first time that he hit a quarterback all season! 5) Seriously,I watch the Browns Red Zone on Sports Time Ohio,where Smith appears every week to chide fans on their "Lack of support". Smith actually expects fans to watch this crap and still clap and cheer??? How dumb can you be??? 6) Check this out by Branson Wright in the Plain Dealer,a list of the bottom five QB's since the Browns return. When these guys play instead of playing charades,you know you are in trouble. 7) How about the always unselfish Braylon Edwards? Less than a week after his "Browns fans hate me because I played for Michigan" whine (Well,I do,but that's besides the point),Edwards threatened to take the money that he uses to donate to underprivileged kids in Cleveland and instead give it to Detroit children. 8) I personally love this quote from the above link-“I’m not Paul Warfield, Webster Slaughter or Jim Brown. I’ve given my all to this city for four years, and I realize it will never be enough. I went to the Pro Bowl last year and resurrected this team from the darkness, and nobody cared. Resurrected the team from the darkness??? My lord,you would think the guy was the messiah!!?? 9) The Browns out passed the Bengals in yardage in this game. 10) And finally, Romeo Crennel says "We will try hard this week against Pittsburgh". Sorry,if I don't see the big outrage on this Lendale White wiping his feet with the Steeler towel thing. I wasn't surprised that Bill Cowher got so excited about it though. Every one of these talking heads that are former players or coaches are in the pocket of their former employers. The Pirates signed Ryan Doumit to a three year extension today with options for two more years. The deal will be worth as much as 27 million and as little as 11.5 million. More on this later in the week when time permits. 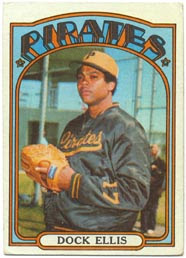 Former Pirate (among others) pitcher Dock Ellis passed away on Friday of a liver ailment in Los Angeles. Ellis was noted for many things in the 70's-his wearing hair curlers in pre-game warmups,his claiming to pitch a 1970 no-hitter while on LSD,his long home run that he allowed to Reggie Jackson in the 1971 All-Star game and his controversial 1976 book-In the country of baseball. 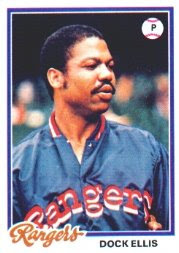 Ellis was 138-119 over his career that was mostly spent in Pittsburgh with stops in New York with the 1976 American League Champion Yankees and the Texas Rangers along with cameo appearances with the Mets and Athletics. 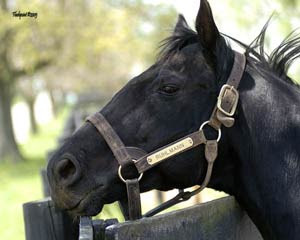 Rest in peace,Dock and best wishes to his family. 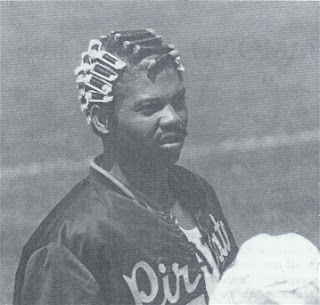 But for all that,Dock Ellis will be remembered by me for one thing first. He was the first big leaguer to sign an autograph for me at a big league park. In 1978,I celebrated my 10th birthday in Baltimore with a doubleheader between the Orioles and my favorite team,the Texas Rangers (That would change over the winter,but that is an other story for another day). Toby Harrah,but the position players were otherwise occupied and unavailable. Harrah would make one appearance in the twinbill as a pinch runner,I recall me going crazy for the cameo. Maybe Ranger skipper Billy Hunter wanted to shut the screaming ten year old behind the Ranger dugout up??(Nah). In between games,Ellis walked by me and saw my newly purchased Ranger batting helmet and spoke to me first about how much he liked it. Back then,hats,shirts etc were not all over the place unless it was for the local team. If you wanted non-Oriole stuff,you had to go to the stadium and find them. Anyway,Ellis signed my program and called over the late Paul Lindblad and had him sign it as well and gave me a memory of a lifetime. That program is still around here somewhere,if I ever get a scanner,I will scan it for here down the road. That day was one of the fondest memories that I ever had of spending with my father. My dad and I have never really spent a large amount of time together,but that day ranked right up there with one of the best days of my life at home. A final note on that day was this exchange between the friend and my father. Friend:Who's that guy in the outfield? The Pirates announced their farm system staffs for the upcoming season. Frank Kremblas comes over from the Brewers organization to take over Indianapolis and new hire Matt Walbeck will be the skipper at Altoona. Former Lakewood Blue Claw manager P.J. Forbes will man the helm for the Lynchburg Hillcats and Gary Green will return at Low A with the new affiliate in West Virginia. Newcomer Gary Robinson will manage the State College Spikes. For the autograph hounds out there,the only former big leaguer that is new to the Pirate organization is the new pitching coach at Lynchburg,Wally Whitehurst. Whitehurst will have plenty of cards from the early 90's to dig up from his days as a Met and Padre. The Pirates also replaced Lanny Frattare last week with the hiring of Tim Neverett from the Colorado Rockies. I am not really familiar with Neverett's work,but he couldn't be worse than Greg Brown,now could he??? And finally,Harrisburg will be delivering on those promised renovations in a two year program that will see some finished for the 2009 opener and the remainder for the 2010 opener. One of the improvements is the addition of a souvenir store that will replace the current NASCAR like trailer. I liked Harrisburg's park and the improvement should add even more to the experience..
Until the next few posts that will cover Devils-Flyers,today's football games and eventually my trip to see the Lowell Devils. This is just a small part of catching up on things. I will be mentioning my trip to see the Lowell Devils,but the main post that deals with the trip will (most likely) be on my next off day. Again,I apologize for missing Friday,although there was nothing I could do yesterday. I really need to get a laptop! The New Jersey Devils host the Philadelphia Flyers today in a one o'clock matinee'. The Devils are coming into the game after a 5-1 crushing of the Ottawa Senators on Friday night. I missed watching the win due to work,but I did listen to Matt Laughlin and Sherry Ross off the XM radio version of the bird. Bear with Hell Raisers as being from what I hear and stat related notes for this one. I don't like to do that,but sometimes that is unavoidable. Patrik Elias scored two goals(14 and 15,both on the man advantage) along with two assists and Zach Parise assisted on four of the five Red and Black goals. The remaining three Devil goals went to Brian Gionta (9),Travis Zajac (9) and John ny Oduya (3). 1) Hate to keep harping on this,but is Patrik Elias on fire or what???? 11 goals and 16 assists in the last 15 games! This is the type of play that Patrik Elias used to give the Devils before the unfortunate Hepatitis issue in Russia during the lost season of 2004-05 and wouldn't it something is after 3 lesser seasons that he could finally be back? I didn't expect it,but I shall take it every time! 2) The Gionta goal was the only one of the five that I actually saw and again s howed the benefit of crashing the net and causing deflections as Gionta got a piece of a Paul Martin shot to deflect by Alex Auld. This team is so effective when they play aggressively! 3) The goal was the third game in a row that the Devils scored in the first two minutes of the game. 4) Bryce Salvador was scratched,but was replaced by the returning Andy Greene. Salvador will also miss todays game with the "upper body injury" as will John Madden,who is down with the flu for the second straight game..
5) On a related topic to my trip to see the Lowell Devils,Hockey's Future rated each teams system and the Devils were ranked in 30th place. As in last,I don't claim to know as much about hockey prospects as baseball ones,but this can attributed to two things. 1) The Devils always pick 20th or lower and have done so for many years. Pretty tough to keep your talent stocked from top to bottom picking down there for that long of a time. 2) The Devils seem select players that either will be so explosive in impact that they cannot resist such as when they traded up to grab a falling Zach Parise or this season when Sweden's Mattias Tedenby plopping into their lap after trading down twice or selects players that fit what they do. Sherry Ross continues to grow on me every time that I listen to the radio satellitecast on the Devils network. She is knowledgeable and offers a wit that takes some time to get used to and takes the listener a few seconds to get the inference,which leads to delayed chuckles from me anyway! I hope to have time later in the day for a seamhead edition,if not look for that tomorrow. Congratulations to coach Larry Kehres and the Mount Union Purple Raiders for thei r winning yet another Division III title over Wisconsin-Whitewater. The 31-26 win avenges last years win by UWW and gives Mount Union their 10th national title under Kehres. Mount Union runs a dominant,yet classy program and they deserve their success. I was back in forth on attending the Mt.Union or the trip to Hershey,but finally settled on the Devils. Snow is expected to fall in both Cleveland and Seattle today and that might make two games that look less than intriging worth viewing. The Garbage Bowl in Cleveland today takes place and I can smell this one from 300 miles away. Only a loyal Browns fans would watch this one,especially over the Devils,but that is why I have two TV's with tape rolling. The Browns have the edge on the obvious stats over the visiting Cincinnati Bengals,better record (4-10 to 2-11-1) and the home field advantage,but the Bengals did win over Washington last week and seem to be playing better football right now. I can faintly hear John Facenda now "Ken Dorsey and Ryan Fitzpatrick lead their teams into battle as the snow drops through the air in Cleveland". The Seahawks meanwhile host the New York Jets in a game that is important to the Jets as they are in a three way tie for first in their division. 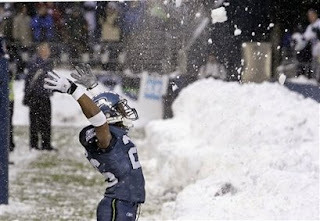 Ironically,there is more snow forecasted to fall during the game in Seattle than Cleveland. Seattle used plenty of breaks to win a game that they shouldn't have in St.Louis last week and look to be the weaker team,but the Jets have lost twice to bad teams (49ers and Raiders) on the West Coast,so don't rule an upset out. I have so many things that I want to write about,but another work call-in limited my time yesterday and I will be away to see the Lowell Devils tonight,so I have to get a little sleep. Look for a few posts late tonight and/or tomorrow for plenty of thoughts on the Devils win over Ottawa,the passing of Dock Ellis,the Pirates finally making a call on their minor league staffs for 2009,my trip to see Lowell and more! The New Jersey Devils were not emotionally sapped from a winning game from the night before against the Buffalo Sabres this time. Instead,they were ticked off after a shootout loss in Toronto and the Sabres paid for both games as the Devils played with intensity,started fast and finished the contest with a 5-3 win. Devils goals to Zach Parise (18),Travis Zajac (8),David Clarkson (6) ,Brian Rolston (2) and Bryce Salvador (2). 1) Might have been the best game of the year for David Clarkson. Putting the goal and assist on Brian Rolston's goal aside for a bit,Clarkson crashed the net and showed just how effective he can be when he hits the net. 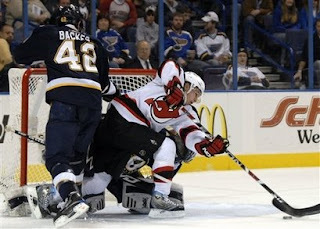 2) One cannot underestimate the Travis Zajac goal that was scored just over 90 seconds into the beginning of the game. The goal showed the late game struggles against Toronto was just that and set the tone for a steady effort over the course of the game. 3) Bryce Salvador left the game in the third period with a "Lower body injury". No word on how serious the problem is. 4) The Devils wording on these injury issues are so vague that I would have to be Ralph Dibny to figure them out. Wouldn't a bruise on ones leg be a "lower body injury"? I mean,really-would it be that big of a deal to say "Pulled calf muscle"??? 5) Patrik Elias finished with two assists to extend his scoring streak to 8 games. I have always liked Mats Sundin,but playing this half season stuff annoys me to death. An excellent site for those of you interested in the Indians minor league system is Indians Prospect Insider. Check it out and if you post,tell them we sent you! And finally,Are you one of those people to wants to give CFL bulbs a try,b ut just cannot bear the shape of the bulb? Well,GE will be marketing CFL bulbs in the traditional shape starting next year. 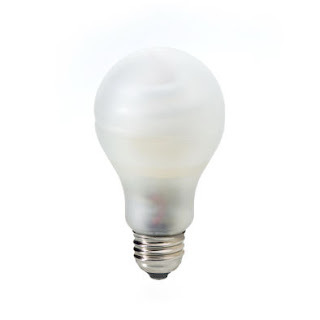 GE will release 9 and 2o watt bulbs in January and increase distribution further as the year goes on. 100 watters will be released in 2010. That is what Scott Clemmensen was in the shootout against Jason Blake,who uncorked the move of the year thus far against Clemmensen and the Leafs grabbed a 3-2 shootout win over the Devils in Toronto. At least the Devils do get one point from the north of the border visit and visit beautiful Buffalo tonight looking for revenge for Saturday's loss to the Sabres. Devils goals to Zach Parise (17) and Mike Rupp (3). Before we move to Hell Raisers,check the Blake goal out. 1) Awfully tough to blame Scott Clemmensen for that,dont ya think???? 2) Second fight in two games for Jay Leach. Perhaps Leach is trying to take the spot of blueline enforcer away from Sheldon Brookbank for good??? 3) With Toronto up 2-1 in the shootout and the Devils in a do or die spot for the evening,Brian Rolston uncorked a slap shot? I know that Rolston has one of the better ones in the game,but I have never understood the logic in the shootout of using the slapper. 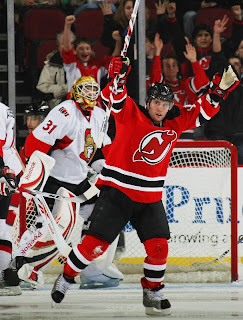 4) The Devils had two late chances to win the game outright. 5) Another question is why Brent Sutter picked the not at 100 % yet Rolston instead of the red hot Brian Gionta,who seems to be more the shootout type even if Rolston was 100%? Andy Greene was activated from the IR today,but did not play. Two Browns and one Seahawk made the Pro Bowl. Joe Thomas will be a starting tackle for the AFC and Shaun Rogers was voted the reserve defensive tackle from the Browns. Walter Jones was named a starting tackle for the NFC and made the Pro Bowl for the ninth year in a row,but will not be playing as he will miss the rest of season due to injury. An interesting article over at Hardball Times looks at our topic from September 2007 on Ted Simmons deserving to be in the Hall of Fame. And finally nice to see after their once every four year run,Penn State extended Joe Paterno's contract through 2011. 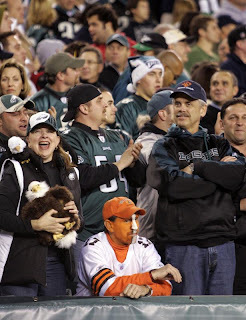 We picked last nights embarrassment at 31-10 Eagles and missed it by one point as the Eagles humbled the Cleveland Browns 30-10. Take away the two interceptions by Brandon McDonald and this game was all Eagles. The Browns fall to 4-10 and finish their home schedule against the Bengals this Sunday at 1:00. Cannot wait for that barnburner! Whoa Nellie. 1) Was it just me or was it wildly apparent with just a few exceptions this team mailed it in??? 2) The 4th quarter interception return for a touchdown by McDonald was the Browns first touchdown in the last four games. The Browns still have not scored an offensive TD in that time. 3) One Brown that has not quit is Shaun Rogers. Rogers left the game with an injury to his shoulder in the second quarter and returned later and pressured Donovan McNabb all night with a bull rush that forced McNabb out of the pocket and even batted a few passes down. It is very hard for me to believe that one of the raps that Rogers brought with him from Detroit was laziness. 4) The Browns also lost tight end Steve Heiden in the game with an injury to his knee and ankle. The only bright spot to an injury to the reliable Heiden would be the increased role for the last two weeks to rookie Martin Rucker,who the coaches seem to be reluctant to play. 5) Another poor night for the slowed Jamal Lewis,who is showing that his contract extension was yet another short sighted move last off season by the Browns. 14 carries for just 32 yards. You will have to excuse me if I stop here. The New Jersey Devils travel to Toronto night for a 7:30 puck drop against the Leafs. The Pirates are reported to have interest in Ty Wigginton,Daniel Cabrera and Jerry Hairston. I could live without Wigginton since he was so awful in his 1st stint in Pittsburgh and his home/road splits were so different last season. Cabrera has an arm that I like,but has many other teams (winning ones) interested and he has control issues. I would love to see the Pirates have SCOTT Hairston,but Jerry does nothing for me at all,especially just after the Ramon Vasquez signing. From the no huge loss department,Jason Michaels left the Pirates for the Astros. Finally,bought my first pack of Bowman Picks and Prospects today and pulled an autograph of Kyle Drabek!!! A late game 10 point flurry turned yet another Seattle loss into their 3rd win of the season as the Seahawks defeated the Rams in St.Louis 23-20. The Seahawks sandwiched the tying touchdown and winning Olindo Mare' field goal around a three and out stop by the Hawk defense in the last three minutes of the game to pull out the win..
1) I know,convenient to return the thoughts after a win,but the last few weeks had a casualty or two and the Seahawks were the one. 2) For a player that that seems to be far from an All-Pro,Jordan Babineaux makes more big plays per capita than most players. Babineaux seems to always be around a fumbled ball and has his share of screen pass picks too..
3) Seneca Wallace played about what you hope for from a backup. 4) John Carlson continues to mature as a receiving tight end every week. 5) The St.Louis fans seemed to be less than interested in the game. Bonus Rounds:One takes wins where you can,but the win could wind up costing the Seahawks in the draft. I worried about the loss of Josh Brown in the kicking game before the season and Brown has done well with the Rams,but Olindo Mare has been near perfect on the year (22 of 24 on field goals and perfect on extra points_. Putting yesterdays game winner aside,Mare shows far more life in his career than I thought he has and has been a rare bright spot in a dark season. Quick Pick on tonight in Philly. The Eagles mantra will be BLITZ,BLITZ,BLITZ,Ken Dorsey will spend the game throwing off his back foot and the Eagles win going away 31-10. My apologies again for being away. The New Jersey Devils won a emotionally draining game on Friday over the Rangers 8-5 and dropped a 4-2 decision to Buffalo on the following evening. I wont get into the scoring details since the games are 2 and 3 days old,but of course we have plenty of Hell Raisers. 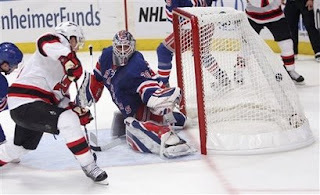 1) The win over the Rangers had to have drained the Devils after speeding to a 5-1 lead and watching the Rangers tied the game at 5 before a three goal combination knocked the Rangers out for the evening. 2) Eight goals for the Devils? These aren't the Devils of old. 3) A nod to Brian Gionta,who has revitalized his game recently. 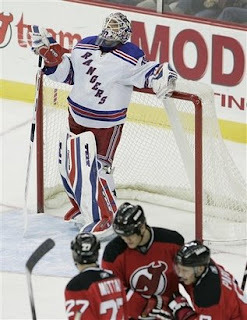 4) And another nod to the Devils,when even I was rocked back on my heels after the Rangers tied the game at 5. But 13 seconds later (and enough time for me to comment to Ryan about how devastating a loss this would be),Patrik Elias took the game back for the Red and Black and set things right in my world! 5) Petr Vrana cleared waivers and was assigned to Lowell. 6) Scott Clemmensen picked the win up against the Rangers despite allowing five goals. I thought Brent Sutter might go to Kevin Weekes against Buffalo. I missed the third period since my job called me in early,so when I left the score was 2-2. 8) The Devils special teams played a huge part in the Ranger win as Jay Pandolfo and Johnny Oduya each tallied shorthanded goals. If the Devils can pick up that part of their game-they are going to be awfully tough when Brodeur returns!!! Hope to be back later with the Seahawks win in St.Louis and a few prayers for the Browns tonight in Philly! Yesterday we smashed the record for hits on the site and we do appreciate it. Thanks especially to James and the fellows over at PhuturePhillies,who seem to have been the main new visitors! The Devils made a few maneuvers before the game as they returned Pierre (3L) LeBlond to Lowell to make room for Mike Rupp,who had been scratched by Brent Sutter for the last few games and attempt to get Petr Vrana through waivers to enable him to stay at Lowell..
Keep your fingers crossed that no one claims Vrana,I want to get him to sign cards for me when I see Lowell at Hershey next week! The Pirates signed utility infielder Ramon Vasquez to a two year 4 million contract. Vasquez is known to Indians fans as the player that Eric Wedge decided to keep instead of Brandon Phillips,who developed into a star with the Reds and left Cleveland needing second base help ever since. Vasquez should step into the Chris Gomez slot on the roster. A few words on Joe Gordon entering the Hall of Fame. I have no problems on Gordon getting in,but I do have a problem with other deserving stars not getting in because Joe Morgan and his gang at the Veterans committee seem to have the attitude of keeping their club as exclusive as possible. Stats never change,why should this farce continue,if you aren't going to vote anyone in? Put the best players and quit being so damn selfish! A few on the BCS. I have never been a huge playoff person. I would not have a problem with one that is done the right way,but the Bowls are fine. Fine,as you know up front the way things are going to be,not the current farce. The Utah and Boise States of the world might occasionally have to be invited to the party,but they will never get to sit on the dais. Everyone that reads this blog knows how much that we love the Ohio State Buckeyes,but the fact that a 10-2 Ohio State team is in the BCS and 12-0 Boise State isn't is a huge and cruel joke. Would Boise State have defeated Texas? Probably not and neither will the Buckeyes,but wouldn't it have been fun to see them try? The Boise State-Oklahoma game from two years ago in Tempe was a blast to watch and had terrific atmosphere as well. I know Ohio State has the national name and the large amount of traveling fans,but shouldn't whats right be a consideration? Tempe didn't lose money the last time that Boise State came to town,they would have made money this time. Every once in a while shouldn't what's right be worth more than a few ex tra bucks???? Terrific fight on Versus last night for the IBF Cruiserweight belt as champion Steve Cunningham defended against the number one contender in Poland's Tomasz Adamek. 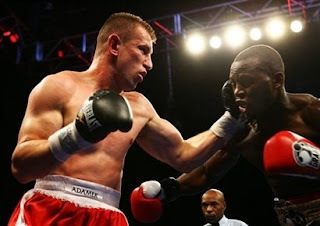 Cunningham won more rounds in our opinion,but Adamek scored three knockdowns over the course of the bout and won the title via a narrow spilt decision. A rematch would be welcomed by all! The Pirates used their selection in today's Rule 5 draft on one of the players that I liked in our recent preview and lost a player that they should not have lost. First,the good news as Donald Veal was the Pirates selection from the Chicago Cubs. I know Veal has struggled through command and control issues for the last two seasons in AA and was awfully wild in Arizona in AFL action,but Veal has a plus fastball and curve and reportedly a developing changeup. Power armed lefty's are rare to find and to pick one up for 50,000 could be quite a find for Neal Huntington and company. Veal finished at 5-10 with 4.52 ERA at AA Tennessee over 145 innings and started in all 29 of his appearances. Two numbers stand out,19 homers allowed and 81 walks. I can live with the homer numbers (although,obviously I would like to see them decrease),but the walks are a concern. New pitching coach Joe Kerrigan will be tested early with Veal as there are issues that could be fixed with some work on Veal's mechanics..
Veal's AFL numbers were worse as he allowed 10 earned runs and walked 13 in a 9 inning fall stint and that likely was the final straw for the Cubs as far as protecting him on their 40 man roster. This is not a sure thing,but I would much rather gamble on a potential impact arm than an average journeyman to eat garbage innings. Sometimes players with talent just need the proverbial change of scenery and that becomes their salvation in a new organization where the expectations aren't as high and attention isn't as constant. Overall,I more than approve of this selection. Take a look at Veal warming up here. The Pirates lost Kyle Bloom to the Detroit Tigers and even though Bloom had a disappointing career up to May of last season,his performance there and in Hawaii made him a valuable selection to the Tigers. Bloom was Altoona's best starter last season and was downright dominant in Hawaii as he held hitters to a .144 average against the lefty. Bloom is far from a guarantee for Detroit though,he really has had just the chunk of 2008 as strong performance and he will turn 26 before the season starts,so he is not a slam dunk. Reports are that Bloom could compete for the 5th spot in the Motor City rotation. Hindsight is 20/20,but an argument could be made today that Bloom should have been protected and Dave Davidson exposed to the draft. The Pirates added two players in the AAA phase of the draft. In the AAA portion,the Pirates are paying for the player and do not have to keep him at a certain level (unlike the major league version). Pittsburgh took lefthanded pitcher Andres Santos from the Yankees with their first pick. Santos numbers in the Dominican league look great,but remember he was almost 22 and pitching against teenagers. The second pick was a player from the same league in Cleveland's Rafael Quintero. Quintero must be built like a rail at 6'1 and 145 pounds! The Pirates neither selected or lost anyone in the AA phase of the draft. The Washington Nationals took Terrell Young with the first pick of the draft. Young split his season between Low A Dayton and the Reds High A squad in Sarasota last year. 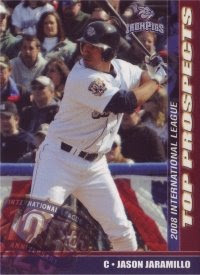 Another year in the Rule 5 draft,where I missed on the top pick as our projected top pick,Eduardo Morlan lasted until pick 16,where the Brewers snapped him up. Morlan and the Brewers hope that he can do what our miss last year did in St.Louis in Brian Barton. Three players that have signed cards for us went in the draft as well. Derek Rodriguez went from the White Sox to Tampa Bay in the MLB draft,while Luis Perdomo was taken by the Giants from the Cardinals. A special treat for you today as I exchanged emails and questions with James over at PhuturePhillies about our newest acquisition(for the next few hours at least) and got his thoughts on Jaramillo. Click the link to shoot over there to see my answers to his questions on Ronny Paulino. I have also added them to the links page as well. That will help keep an eye on some of our favorites that have passed through from Lakewood,such as Dominic Brown. TRS:I saw Jaramillo play several times here (Hagerstown) with Lakewood. He seemed to be solid defensively and had quick feet. James:Defense has been his calling card since he was drafted. There was one suspect report in 2006 I want to say that said he was having some issues defensively in terms of his positioning/blocking balls in the dirt, but nothing else ever came of it. He was basically viewed as a defense first guy who might hit for average. TRS:I saw Lou Marson here as well and his tools far exceeded those of Jaramillo. Did Marson pass Jaramillo as a prospect immediately or more as he climbed the ladder?? James:Yeah, this is accurate, Marson definitely bypassed him this season, and if we're looking at overall prospect value, he was also bypassed by Travis D'Arnaud, a supplemental 1st round pick in 2007. The Phillies chose to add Marson to the 40 man roster and call him up in September despite Jaramillo already being on the 40 man, so that was kind of the writing on the wall for JJ. TRS: Normally,when players repeat levels their offensive numbers improve. Jaramillo's remained roughly at the same level,albeit on a bad team. In your opinion,is this what we can expect from him- .260 and 5 Hrs??? James:Its really tough to figure out what happened, as Lehigh Valley got off to a terrible start before recovering. The team was filled with minor league mercenaries for the most part, with Jaramillo and JA Happ the only real prospects of note until Carlos Carrasco arrived late in the season. After a terrible start (.193 in April), he hit .284 from May till the end of the year. In the big leagues, I'd project him as a .270/.335/.390 type guy, maybe 20 doubles, 5-6 HR and solid defense. TRS:Throwing wise,do you consider his arm highly above average or slightly above average? 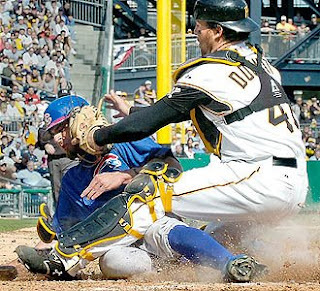 With Doumit as the main catcher with defensive skills that are often lacking,Pittsburgh seems to be need of a backup that has the ability to gun runners down occasionally-your thoughts? James:His arm is above average, from all accounts, and from the times I've actually seen him catch and throw, I didn't notice a lot of sailing or tailing on his throws. He threw out 26% of attempted base stealers in 2008, but its really tough to know how much of that has to do with the catcher and how much has to do with pitchers not holding runners, things like that. I feel he'll definitely be major league average defensively. TRS: The Pirates have said that Jaramillo has obtained mainly because of John Russell's familiarity with him from their Ottawa days and would compete with Robinzon Diaz for the backup role. Not sure on your knowledge of Diaz,but would you give the edge to Jaramillo against him and why??? James:I'm vaguely familiar with Diaz. He's got a decent arm if I remember correctly, but I know he DH'ed quite a bit in 2008, and some in 2007, so I wonder about his defense. I know he has the strong arm, but there's more than that to it. He might have a bit more pop in his bat than JJ, but I think as a whole, Jaramillo has a slightly better overall package. TRS:Was this basically that the Phils thought they could lose him in tomorrow's Rule 5 draft or more along the lines of getting value for him now before he could lose some in 2009?? James:Well, Jaramillo was already on the 40 man roster, so he wasn't at risk of being taken. I think they basically viewed him as being very similar to Ruiz, ie, a defense first guy. I think they might view Paulino as having a bit more offensive upside, and if I read it right somewhere else, he's having a good year in Winter Ball. My guess is that Chris Coste is going to either be non-tendered/traded, and Paulino will assume the backup role. The front office feels Marson might need more time in the minors, and this will allow him to play every day at AAA. Thanks to James for the time. We could be back later if the Pirates select someone in the Rule 5 draft and add some comments! Joggin' Ronny Paulino badly wanted out of Pittsburgh (or Indianapolis,but that is beside the point). The Pirates wanted to move him before his attitude became contagious. Jason Jaramillo in a swap of backup backstops. The Post-Gazette reports that John Russell was a main factor in bringing the Oklahoma State product in as Russell managed in him 2007 and must have been impressed with something from Jaramillo. Jaramillo has never played in the bigs yet,despite decent numbers and but was seemingly behind Lou Marson in the Phils catching prospect hierarchy. Jaramillo played here in Hagerstown in 2005 as a member of the Lakewood Blue Claws and as often we see the Claws here,I got to scout him often. The bat is about what you would expect from a backup catcher,not a lot of power as his 8 homers last year in Lehigh Valley was a career high and was average in OPS as well. Jaramillo will likely be a 250-265 hitter and that is acceptable for a backup catcher. Defensively,he is solid,but not outstanding. I remember his arm as being above average,enough to at least not allow runners a free pass anyway. Jaramillo should be exactly what he should be next season,a good backup catcher that will not have fans shouting for him to play more,but solid enough that he wont kill you if he has to play extended time in case of an injury to Ryan Doumit..
Paulino had been adamant about leaving the Pirates since last season and had a few teams interested after a strong winter season in Puerto Rico. Paulino will backup Carlos Ruiz in Philly and I would question how happy he will be backing Ruiz up when he could never handle sitting behind Doumit. But the Phillies too were able to turn a player that could be third on their catching prospect list (behind Marson and Travis D'arnaud,who we should see this year in Hagerstown on Lakewood visits) into someone that they think can help them. The Pirates get something for someone I would have been happy to just see get out of town,so that is a good move. The New Jersey Devils used a fluke play in the second period to break a scoreless tie and dominated the game thereafter in defeating the Pittsburgh Penguins at the Rock 4-1. Travis Zajac shot the puck into the boards and as Dany Sabourin turned to play the puck,it bounced straight to the waiting Zajac,who slammed his 5th goal in the net and the Devils never looked back. Zach Parise (16) and Dainius Zubrus (7) stretched the lead to 3-0 in the third period before Pittsburgh scored their only goal of the night. Patrik Elias ended the scoring with an empty netter (11) to finish the scoring. 1) Great game by Scott Clemmensen tonight with 26 saves on 27 shots. The pipes helped him a bit as the Penguins clanged a few shots off them,but overall,Clemmensen continued to play well. 3) Bryce Salvador left the game late after being hit in the face with the puck. 4) Had to feel good for Travis Zajac on his goal. Zajac was hustling on his entire shift and being in the right place at the right time was the result. 5) Andy Greene was cleared to begin skating and could be playing again next week. The Indians were involved in a three team deal tonight with Seattle and the New York Mets. The main name in the trade was Mariner closer J.J.Putz going to the Mets,where they want him to be the setup man for newly signed Francisco Rodriguez. However,the agent for Putz has already stated that Putz wants to close and will not be happy as a setup man. The Tribe sent Franklin Gutierrez to Seattle and added reliever Joe Smith from the Mets and second baseman Luis Valbuena from the Mariners. 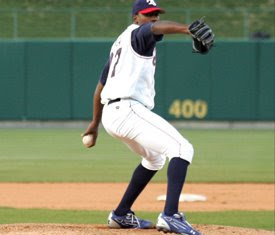 Smith should help the Wahoos in the pen after a solid 2008 in middle relief,while Valbuena spent September with the Mariners and should be the starter at AAA Columbus. Smith is a sidearmer that is especially tough on righthanded hitters and should be their top middle reliever next season. Gutierrez always seemed to be one of like 10 interchangeable Cleveland outfielders that hit 275 with 12 homers,so he should not be a huge loss for Cleveland. I am not a huge Arena Football fan,but it looks like their league is trouble and may not play in 2009. They say that they will return in 2010,but have you ever known a league to take time and return? Back later with an interview on the Paulino-Jaramillo trade! 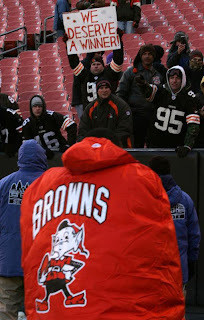 Browns:How long should it take to write awful?